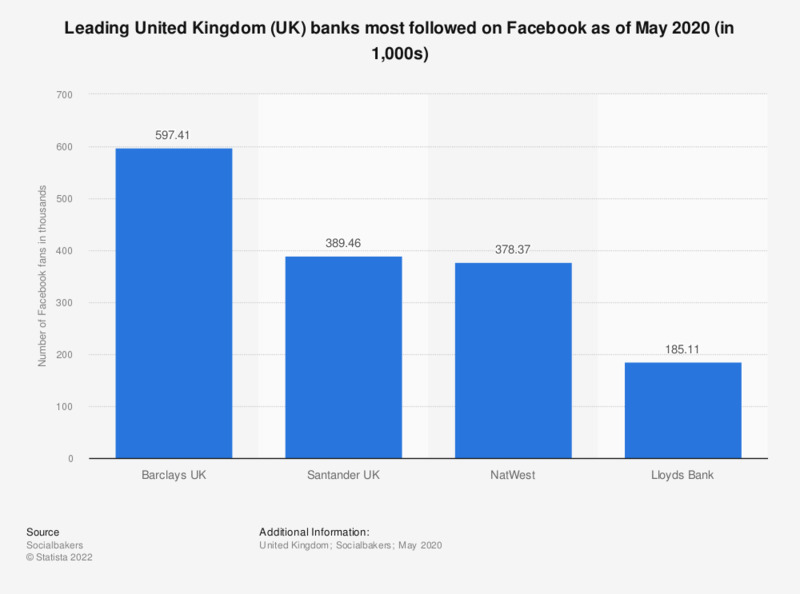 This statistic shows a ranking of the five leading banks in the United Kingdom (UK), ranked by the total audience on the social media portal Facebook, as of May 2018. In that time, Barclays UK proved to be the most popular bank on the UK market as per Facebook fans, amassing the audience of over 594.7 thousand people. Second in the ranking was Santander UK; with approximately 391.4 thousand people following the updates of the bank on the social media platform. Third one was Nat West, with 336 thousand people as its Facebook fans. Facebook audience estimates are an important way to learn about the customers, with regards to the insights into segmentation of the following and the frequency and type of their interactions with the bank. As such, they should not be undervalued. According to data from other European countries, online banking account holders frequently used Facebook for reading bank reviews or requesting assistance in 2016. In the era of the digital technologies leading the disruption within traditionally conservative industries, such as financial services, the power of social media cannot be discounted.